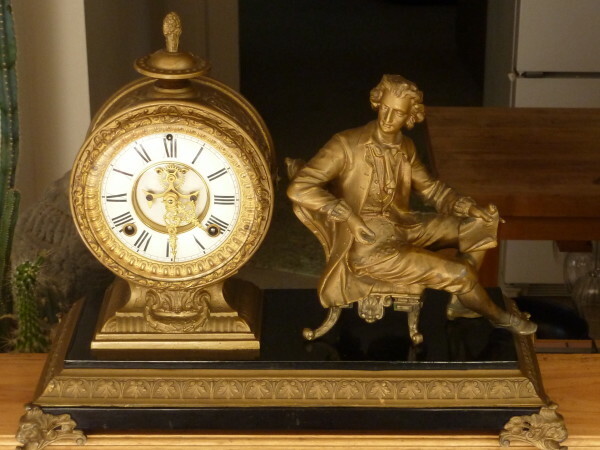 This Ansonia “Mozart” Clock is cast bronze with Ormolu gilding. 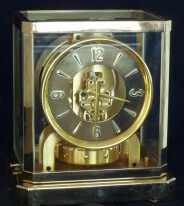 Ormolu was used in lieu of gold gilding and is made from bronze, zinc, and tin; its use was discontinued by the late 1800s, dating this clock to around 1890. You can see in the photo that this gilding is much brighter around the dial which is under the beveled crystal protecting it from oxidation. The dial is two separate pieces of white enamel with an open escapement. The clock chimes on the half hour and rings out the hours. It is quite heavy and large measuring 18″ wide and 14″ high.